Whereas my last blog entry wasn’t palatable to write nor read, the cover story [on this issue] had me salivating for more. Published unnumbered as the 21st entry in the American Science Fiction Magazine series, it boasted a truly wonderful illustration rendered, as usual, by the highly adept Australian artist Stanley Pitt. 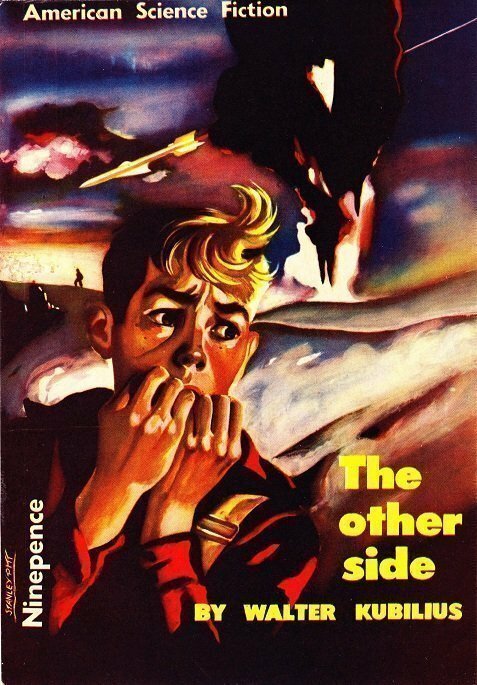 Cover illustration is for Walter Kubilius The Other Side. Jim Carrington, a farmer’s son, comes to the realization that something just ain’t right about his folks, the doctor, and, well, just about everyone else. They’re all skittish about the “dome” that protects them from the outside radioactive elements, yet, the lake that he swims in has never caused him any harm. The lake is cut in twain by the dome’s rim, and, while diving down, he accidentally discovers that he could swim under dome’s rim, to the radioactive war-obliterated side. Naturally, it stands to reason that if the doctor’s daily check-ups do not detect any radiation upon him, that the lake is clean. He later learns (from the school library) that he is not living in the 1970s, but, rather, decades, centuries even, possibly, in the future. After trying to discover the truth from his family and the doctor, late at night, he sneaks out of the farmhouse, swims under the dome, and emerges into total darkness. Nearby is a ramp that seems to literally ascend most the length of the dome’s height! He finds some “levers,” touches them and the first states “Species: Man.” The second lever explains that the human race was conquered and annihilated, and that this human male inside the dome is the last known being on the planet. The dome is nothing more than a “zoo,” and the other people inside are cleverly created robots to maintain the facade. The second lever further details that if the male escapes, he’s to be caught, detained, and delivered to the dissection chambers. No sooner than this is transmitted to him, he hears an alien, slithering sound approaching…Death. Honestly, I FREAKING LOVED this grim story. I like realistic stories, where the “hero” doesn’t always win the girl, the day, the world, or survive, etc. I highly recommend this tale. The booklet is padded with two short tales. The first is The Two Shadows by William F Temple, which merely expounds upon what is probably Temple’s personal life views, and fails to realize that helmetless humans on Mars would not be a pretty sight. The last entry is Walk to the World by A. J. Budrys, a semi-deep philosophical story detailing man’s worldly conquers and what happens when they run up against another race of “humans” that also conquer worlds, but, without violence. Will we kill this other race or embrace their non-violent ways and mesh with them and therefore, join their race to discover new worlds, peaceably….who knows?